Open floorplan condominiums from studio size to 3 bedroom make up the Four O’Clock Lodge condos for sale, which is 200 steps from the Snowflake Lift, and is an easy ski down Four O’clock run from the base of Peak 8. This location means any condos for sale in Four O’clock Lodge will be extremely convenient for skiers in the winter – ski in and step across the street to ski out – and offer potential rental income. In the summer 4 O’clock Run is a public trail that gives access to the national forest and offers a pastorial path downtown, which is a short walk downhill. The condos at Four O’clock Lodge are also on the free town bus system. Do you think these condos are perfect for you? Browse the Four O'Clock Lodge condominium listings below, or find out more about choosing this development in Breckenridge. 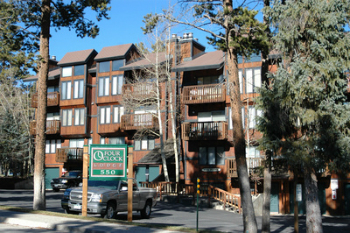 The architecture of the Four O’clock Lodge is typical of the condos in this slope-side neighborhood, tall with three floors of condos about ground level garages. Vaulted ceilings, and more windows make the top floor units more desirable, although ground floor units mean less steps and less ski shlepping. Condos in Four O’Clock Lodge come in a variety of sizes, and are set up for efficiency and housing families or groups of ski vacationers. The kitchen area is along one wall below vaulted ceilings that create a loft above the main floor bedroom(s). HOA: water & sewer included in dues; managed by Woodwinds Lodging. Amenities: ski-in, Snowflake Lift across the road, on free bus, 2-blocks uphill from downtown Breckenridge, on Four O’clock Run. 550 Four O’clock Road is located on the north side of 4 O’clock Road, just one condo complex downhill from the base of the Snowflake Lift. From the Riverwalk Center in the heart of downtown Breckenridge, cross Park Avenue and head west on Four O’clock Road and climb gradually uphill for about a block. Four O’clock Lodge Condos will be on the right at 550 4 O’clock. The Riverwalk Center is 1.5 miles from the traffic circle on the north side of Breckenridge, along the main route, which is Park Avenue. Do you want more information about Four O'Clock Lodge condos for sale? Send us a message, or phones us at (970) 453-2200 to talk to a professional from Breckenridge Associates.